I just want to say how much I appreciate the Sparking the Noggin writing course! All 4 of my kids (13, 11, 11, and 10) are taking it. We're on lesson 22 and STILL loving it. For two of them, writing is more challenging because of Dysgraphia and Audio Processing Disorder. Trying to get what's in their head onto paper is hard for them and trying to get a sentence on paper has been like pulling teeth. Now they are writing 2 page stories! They come find me because they want to read their stories to me and their stories are so creative and well written! All 4 of them actually ASK to do writing now. Thank you to the writer of that course! The Orphans of Mordecai's Castle is the first in a three-part series of chapter books. It has 23 chapters for your child's reading delight. The characters are introduced within the first few pages. The preface gives a little of the back-story, telling how one of the orphans became an orphan. The first chapter jumps to the present, where the children are on a ship. Something happens to the ship, and the children are separated from their guardians. The children band together and look out for each other while they face new problems without any adult help. The children learn to rely on their faith in God and His love for them to get them through. A twist at the end of the tale shows how God has everything in His control and providence. His love wins out in the end! This book would be perfect to use as a supplement to a reading program. Fluent readers will enjoy the mystery and adventure in this story. The chapters are kept short, and the story moves easily along. I wouldn't give this book to a child who is new to chapter books, but the length of this book will keep more experienced readers happily enthralled. Because of some of the topics, the content of this story would appeal more to an older child. The theme of purity is addressed within the context of God's Word. The issues of a heart darkened by the love of money and the hatred and rebellion that spew from a heart of bitterness are addressed as well. Cara Simmons weaves the tale so well that the twists at the end really catch you by surprise. It makes you want to go back and read the whole story over again to see if you can catch any subtle hints leading up to the revelations. This book was so edifying! I'm eagerly awaiting the second and third installments in the series. I am so thankful to Cara Simmons for writing this series. Stories about a child's strong faith in God need to be flooding our Christian bookstores, especially at the rate children are being bombarded by things not true to God. I remember all the outside helps that encouraged and reinforced my faith in God growing up. I never strayed from His love in my younger years, and I owe that faithfulness to His grace, mercy, and guidance. It was books like these that my mother introduced to me that made a difference and showed me that holding on to God is important. There weren't too many books like this when I was growing up, but praise the Lord for people like Mrs. Simmons who have answered the call to write the vision! I highly recommend this book to everyone who has children at home that can read fluently on their own. Your children will love this story of other children who are just their age and are getting by on their own and relying on God. Click this link to see the review posted on the website. ​I am a mom of three girls. My oldest graduated from a brick and mortar school, and my younger two have been homeschooled for the past five years. One of the things that I disliked about the brick and mortar school was the selection of books that they required the students to read during the course of their education. There were times that the books selected weren’t appropriate and were not books that I would want my children to read. Although I did not receive Book 1: The Haven, to review, I know that it is one that I will get for my family library! 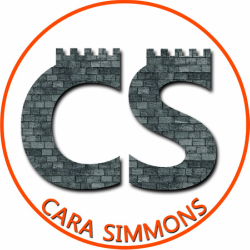 Cara Simmons was born and raised in Vermont and is a homeschool mom herself. I found her story very inspirational. As a mother of five kids she saw a need and filled it. Her goal was to create Godly reading material for her own kids and my family was able to reap the benefits! She wrote this series for grades four and up, and they are relatable to all age groups. I am very thankful that she saw fit to follow the prompting that God placed inside her to write these books, they are truly unique! Book 2: The Leviathan – Based in the 1800’s this book about 13 orphan children is absolutely delightful. Stranded on an island and taking refuge in a castle, these orphans range in age from 4 to 16. After realizing they were beached on an island, they managed to take refuge in a castle for shelter. There were many scary things that followed and the kids were thankful that the Lord had taken care of them. Mr. & Mrs. Carver (missionaries) became guardians to these delightful children after spending time praying and fasting for God’s direction. The island was home to a lot of adventures and harrowing circumstances. At every turn the orphans are faced with peril and the old superstitions about what lives on the island, and in return they put their hope and trust in the One True God. Knowing that He is a faithful Father. Book 3: The Champion – This is the third and final book in The Orphans of Mordecai’s Castle series. Another year has passed and life on the island is just as lively as ever! Peculiar things are happening on the island. As the orphans face extreme situations they are shaken to the core of their faith and have to refocus their faith in a faithful and loving God who proves himself to be their Champion. We were able to use these as a supplement to our English/Reading program for my ninth grader. These novels are well written and exciting. Our family loves books full of thrills and adventures and these books fit the bill! As soon my daughter cracked the cover, she was hooked. I give these books two thumbs up!! The cost of each of these books is $14.00 and at that rate, it is so easy to purchase the entire set for your homeschool or classroom! Click this link to read this review on the Old Schoolhouse website, as well as another review from another mother. "As we encourage our young people to develop a love for reading, we often discover how hard it is to provide good, godly Biblical material for them to read. Much of today’s “Christian Fiction” differs very little from what the world is producing, except they mention Jesus now and then. It is refreshing then to find a book and an authoress that are both grounded in the Word of God. Cara’s book is not only entertaining, it is instructive to young minds. It is a “safe” book to hand to our children because it is solidly based on the Bible. What a great treasure this book is!" We just finished your second book- it was sooooo good! I love how the characters so freely share the gospel and live as witnesses for Jesus all the time. My boys were hanging on every word and didn't want me to stop reading. How I would love to read more books like yours to my children. Thank you so much for writing such inspiring books. Looking forward to meeting you at the book club. "This book would be perfect to use as a supplement to a reading program. " I just wanted to thank you for a wonderful book! We just finished reading 'Mordecai's Castle' this morning. I have been using it as a read aloud for my boys (3, 5, 10, and 12). They just loved the story and I enjoyed reading to them with no worries of anything inappropriate. You are very talented and we are thankful for your story. We are looking forward to your next book! Have a wonderful day and GOD BLESS YOU! up on the website! Thank you!